- Saturday was Dusty's birthday and second round finish of the 48 - 4,000 footers. The weather turned out to be absolutely perfect, in the high thirty's to low forty's with abundant sunshine and no wind with ground cover snow to about eight inches up high. - Steve, Denise, and myself joined in with Bob, Geri, and Dusty as we made our way to Zealand Falls Hut where we took our first break looking at Carrigain Notch off in the distance. From here Denise lead the way up the Twinway to our next stop, Zeacliff. Views from the Zeacliff outlook are some of the best around and today with the snow capped Presidential Range off in the distance it did not disappoint. Also, the view straight down to Whitewall was amazing, too! - From the Zeacliff outlook we all made our way to the no thrills summit of Zealand Mountain, Steve walked off a bog bridge and punch his leg half way to his calf making for a muddy tail runner and pants but he was laughing about it all the way, Steve by this point was in a t-shirt and kept it on for a majority of the hike! - The snow depths increased a little as we hiked to Zealand and then down and up to Mount Guyot. Along the way we ran into Tim M. who was speeding along doing an extended Pemi Loop, Tim, has hiked all 48 - 4,000 footers three times in one winter, think about that for a second, impressive times three! - We popped out to the Alpine Zone and were rewareded with excellent views. Hiking above from treeline on North Guyot over to Mount Guyot is one of the best stretches of hiking in the White Mountains, it's a relatively easy section of hiking (weather dependent, of course) and it's absolutely beautiful. The Presidential Range rises high above to the north, West Bond and Bond loom close by to the south, Franconia and Garfield Ridge Ridge is in view to the west, Owl's Head sits quietly below in the horseshoe that makes up the Pemigewasset loop, and the Twin Range slowly rises above Guyot from the direction we just came from. Pretty amazing views! - After Guyot we dropped back below treeline as we headed to West Bond and then over to Bond. The snow depth made for some slipping and sliding at times but there was no need for traction. I was in trail runners, and while they got a bit wet it was a non-issue as it was warm enough that my toes stayed warm. Soon though, I'll be in waterproof runners or my boots! 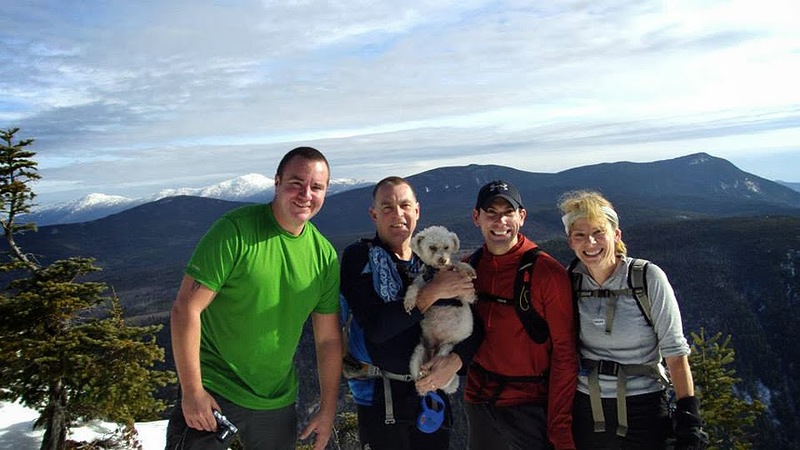 - As we dropped down to Bondcliff we ran into Ryan, Kristina, and their dog Jack. We all talked for about ten minutes before they went on their way. They were doing a thirty mile hike / run of the Bond and Zealand and looping back to Lincoln Woods by Ethan Pond, Thoreau Falls, and the East Side Trail once dropping down from Zeacliff. - We did a little trail running ourselves on the way to Bondcliff where we sang happy birthday to Dusty. dusty celebrated with a doggy cupcake as we took a long break and warmed up in the sun before the long nine miles back to the car. - I don't mind the long miles back to the car, I usually run most of it now and stop and take pictures along the way. I've come to love the old railroad grade over the last five miles, especially the part in the Pemigewasset Wilderness. - The hike / run out went by quickly as Bob, Dusty, and me headed to the car first so we could go into town and grab some soda's (chocolate milk for me!) and chips for the others as they made their way back. We also gave a ride to a couple celebrating their twentieth wedding anniversary in Loon Mountain, they hiked a whole Franconia Ridge Traverse and need a ride back into town. Steve, Dusty, Denise, and me on Zealand! Denise striking a pose on West Bond! 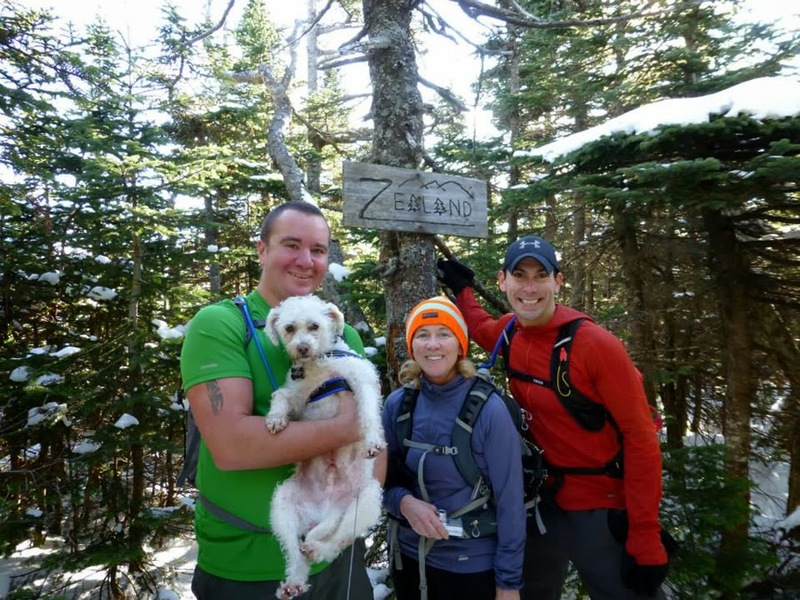 Denise and Bob chat with a couple of the best ultra-runners in New England, Kristina and Ryan! Awesome report Chris ! I can only dream of being in that kind of shape to do that hike. Perhaps someday. (like when we retire and move to New Hampshire). Hiked in from Lincoln Woods to the bondcliff trail junction last August - nice area :) Since we are working on the 48, we'll have to do that someday ! Beautiful pics. Thanks Wendy! You will love it when you get up there, such a pretty place to hike. Save it for a good weather day to take in all the views! Great pictures Chris. Looks like great company to have on a long hike. I'm sure some day down the line you two will hike again. Hang in there Super Hiker!